Heading off to doctor’s appointments, treatments, etc. means carrying a lot of stuff with you. Most of the time, you have to wait and a good book or journal makes a wonderful ‘wait partner’. Chemotherapy treatments can take a while. I often carried meditation tapes with me and plugged in for the duration. 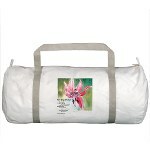 It helped me relax and transport me to another place while the treatment was taking place. Having a sturdy, roomy and – bonus – inspirational – tote bag is a great way to manage the bits and pieces while providing an inspirational message to keep you focused and positive. Staying positive and involved in your own healing are definite prerequisites to keep in mind. 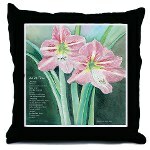 As a friend or family member, these types of items make excellent inspirational gifts for cancer patients. I know many people ask for suggestions on what would be useful to their friend going through cancer. Here is one idea. Why is Journalling Important in the Cancer Healing Process? A cancer diagnosis involves much more than the surgery, chemotherapy and radiation. At first, this is where the focus is centered as you enter the activity whirl of doctors, hospitals, treatments, and medical appointments. What goes on inside – the psychological and emotional turmoil – is not seen by others. That doesn’t mean these ‘feelings’ are less important. In fact, they are not – they are very important. However, sometimes it is hard to understand what it all means. Thoughts rabbit around in your head. Emotions bubble up at odd times. Sleep becomes elusive when darkness comes. It is nighttime that often the mind turns on. One way to unravel and start to see patterns of thought is to write them in a journal. In the writing, thoughts and emotions spill onto the page taking up less space inside of you. On the page, the subconscious will speak allowing new insights and perspective. This will give you an opportunity to quietly heal the sore spots, identify areas you may wish to explore, and allow a sense of calm to reside within you. Journalling is a private way of coping with cancer. There are many wonderful choices of journals – some are inspirational with messages to help guide your thoughts, others have unruled pages allowing for not only words, but also images, drawing – creativity. Some are leatherbound, others simple notebooks. 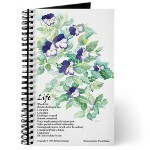 If you are a family member or friend of someone who has cancer and have wondered what to get them, journals make wonderful inspirational gifts for cancer patients. Team a journal with a beautiful pen and you will give a cancer patient something special. One of the healing modalities I used during cancer treatment – and even now – was journalling. There is something very therapeutic about taking the thoughts that are running around in your head and putting them on paper. Much like unwinding a tangled ball of yarn for those of you who are knitters. 1. The emotion attached to the thought once unravelled and seen on paper seems to dissipate if not go away entirely. Often a solution pops out or a new insight emerges. 2. I found I could see patterns of thought – issues that kept reappearing on the page as reoccuring themes. It gave me a chance to rethink and change what wasn’t working – and acknowledge what was working. 3. Messages would appear on the page – seemingly from somewhere outside of me – the universe . Now you think I’m a ‘woo-woo’, but truly there is a connection between a higher power, however you define higher power, and you. It’s not unlike artists or writers who have the feeling they are being guided – that they are the messenger only. I have at times gone back to look over old journals and can recognize how far I have come from the person I was during treatment. Healing has occurred and continues to occur as life moves forward. There will always be challenges. How we deal with them is one of the keys to healing. Journalling helps us see what our mind is processing. 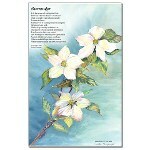 If you are looking for inspirational gifts for cancer patients, journals are a wonderful choice. Many times, I have given a journal as a gift to a friend going through cancer and it has always been appreciated. We all need something to carry our gym stuff in – shoes, exercise gear, socks, etc. Now that cooler weather is coming, most of us will take our workout inside. How chic to have something different – a gym bag with a message – something to motivate us and remind us of the finer points of living. For those going through health issues, such as cancer treatment, tote bags or gym bags for carrying journals, snacks, water bottles, music, etc. can become unique inspirational gifts for cancer patients or someone who has frequent doctors appointments, etc. Unique bags are also a signature item – they work for anyone. We often need to be reminded that life is precious and it pays to slow down to appreciate the small moments often missed in our ‘hurryness’. Life presents many challenges. Some challenges we can control, others we cannot. At these times, surrender may be the option. However, this is not easy. Most of us in life want to control everything around us. Getting a cancer diagnosis brings this issue up front and centre the fact that control is not always possible. Inspirational poems shedding light on difficult issues, such as surrender to life situations, or even just sharing a different perspective can offer encouragement and a gentle reminder on days when life seems confusing. Our lifestyle in North America does not leave much space for quiet time. We are constantly striving to get more and more done in our days, weeks, years. Little time is spent in contemplation or down time – time to give our brain a rest and rejuvenate. Cancer is a big wakeup call that says loud and clear – Slow Down, Regroup, Rethink Priorities. Inspirational gifts for cancer patients – anyone for that matter – can reflect values and thoughts of life lessons such as the poem ‘Quiet Time’ on the pillow (left). These inspirational poems or sayings on everyday items can be subtle reminders to Slow Down, Regroup, Rethink Priorities. The cancer journey awakens emotions and issues which, in the light of day, we try to ignore. Sometimes they are buried deep inside of our soul, hiding and jump up at unlikely times. Journalling is a way to explore these feelings. Life pops out on the page, often surprising us with insights and new ways of looking at our life. Journals make thoughtful inspirational gifts for cancer patients. Consider one with an inspirational poem on the cover to give a starting point for the journey. Cancer is not the only time that we need inspiration. Life throws us curve balls now and again, and finding something that will inspire you to move forward and through these times is important. We all find inspiration in different ways. Books of courage helping us realize that most everyone in life faces challenges. It’s how we deal with them that is the measure of the person. Going through cancer is very scary and having resources that provide inspiration at this time makes the journey a little easier. You are not alone. Having a handy tote bag, especially one with an inspirational poem, is a necessity for carrying around essentials that don’t neatly fit into a purse. This is particularly true going through cancer treatment as you spend a lot of time waiting. Having on hand a water bottle, book, journal, extra sweater, DVD, etc., helps fill in the time and ease stress. 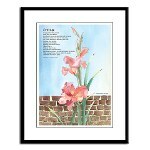 Inspirational poems can often lift our spirits and give us new perspectives. They are short and easy to read and remember. Also they are often written by those who have gone through similar experiences and share what touches their soul. Carry inspiration with you. With summer upon us, it is more important than ever to have plenty of water. Our bodies are quickly depleted of moisture due to sweating, exertion, hot weather, hot flashes, and exercise. Like plants, we wilt without being “watered”. And, water is the drink of choice rather than drinks such as sodas, juice, tea, coffee, etc. The container you use for the water is equally important. Much has been said about the dangers of leaching of chemicals from plastic containers, especially when put in the freezer and then thawed. Another issue is the quality of bottled water. It pays to do your research. 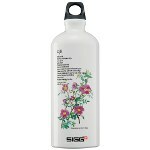 Having a quality stainless steel water bottle which you can fill up with filtered water, whether from home or other known source, is a much better option. Not only that, some of these water bottles are very “cool”. 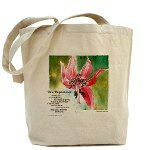 Try one with an inspirational poem on it – a constant reminder of something positive. Whatever you choose, be smart, be safe, and be healthy.